The first definitive Latvian stamps appeared very quickly after the end of World War I. Before World War I, Latvia was part of the Russian Empire, and Russian Imperial postage stamps had been used there. During World War I, Latvia was occupied by Germany, and German Imperial definitive postage stamps overprinted "Postgebiet / Ob Ost" had been used for postage. After the collapse of the Russian Empire in October 1917 and the departure of the German occupation forces after the end of World War I, the Republic of Latvia was declared on November 18, 1918. Four weeks later, on December 18, 1918, the first printed postage stamps of Latvia were placed into use. When the first Latvian stamps were printed in December 1918, there was a serious paper shortage. To overcome the paper shortage, the first Latvian postage stamps were printed on the backs of German military maps. 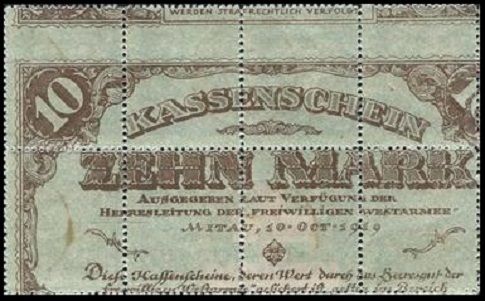 Lined paper was used for printing some of the definitive stamps of 1919, and on two later occasions, some commemorative stamps were even printed on the backs of unfinished German occupation banknotes. The new Republic of Latvia would not last very long though. By the terms of the Molotov-Ribbentrop Pact of 1939, the Republic of Latvia was awarded to the USSR. During World War II, Latvia was occupied by the army of the USSR (1940), the German army (1941), and then again by the army of the USSR (1944). In 1945, the former Republic of Latvia became the Latvian Soviet Socialist Republic. Latvia would not be free again, for another forty-six years! During the 1920's and 1930's, Latvia produced a wide variety of definitive, commemorative, charity, and airmail postage stamps. Not counting the Soviet and German occupation postage stamps, in the years between 1918 and 1940, the Latvian postal service issued about 375 stamps, and none of them are unreasonably expensive, at least from a philatelic point-of-view. Even the many imperforate-between-pairs listed in the Scott catalog are fairly inexpensive. For the serious stamp collector, a nearly complete collection of the major postage stamp issues of Latvia is easily attainable. 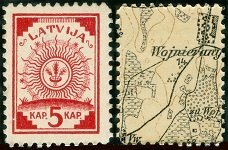 Links to historical articles and reviews of many of the postage stamps of Latvia will eventually appear at the top of the third column of this page.